Home > Asia > 1963 > Edinburgh Business School China Director On The Rise Of The MBA In China! Edinburgh Business School China Director On The Rise Of The MBA In China! 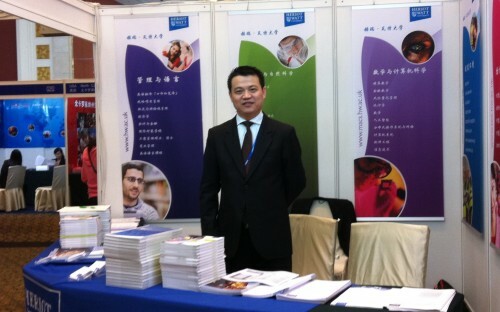 Edinburgh Business School grad Zhongyi Wang heads his alma mater's office in Beijing. More Chinese students are opting for home grown MBAs, he says, but there are also more cross-border programmes! Former advertising entrepreneur Zhongyi Wang thought he had a clear career vision before coming to Edinburgh Business School for an MBA. Wang wanted to gain an international perspectivs and use it to expand his company’s non-Chinese client base. But his alma mater came calling with a job offer that was impossible to ignore! The Tianjin-native is now the head of Heriot-Watt University (HWU)’s China & East Asia office, and describes it as “a dream come true” when the Scottish university offered him a full-time job managing its East Asian market, five years after graduation. “I have always had close ties with my alma mater and especially Heriot-Watt University’s Edinburgh Business School. When I accepted the job I knew that I had a distinctive advantage other MBA grads perhaps didn’t have: knowing both Scottish and Chinese culture, I could successfully promote this cultural and educational exchange,” says Wang, who got his MBA in 2003. During the time of waiting for graduation ceremony for his MBA degree, Wang was asked to help out in a Chinese market research project in education for Interactive University (IU), an non-profitable organization in Scotland. Impressive work was turned in, and he was asked to establish a China office to promote Scottish higher education. Wang, at the time still a director at Tianjin MeiRui Adverting Co. Ltd., next worked for Scottish Qualifications Authority (SQA), Scotland’s national accreditation and awarding body, as a representative. He was at that post for a year before being approached by HWU, who took notice of the job he had done at IU and SQA. After working closely with the Chinese authorities and institutes for a few years, he had accumulated a rich book of contacts in China that proved to serve his next role well. His official job description of the Heriot-Watt role heavily focuses on establishing and developing partnership as well as student recruitment. The number of enrolment of Chinese students for September 2012 intake has jumped by four times since he took the post in 2008 .Now the University has expanded his responsibility to some East Asia’s regions and countries, such as Hong Kong, Taiwan and South Korea. How did he do that? “The key is to find accredited partner in this region,” says Wang, who masterminded the strategic partnership between his employer and Chinese Service Centre For Scholarly Exchange (CSCSE), which is affiliated to the Chinese Ministry of Education and offers services for Chinese students studying abroad. Wang says: “Well-worked partnership with CSCSE has helped HWU enhancing the university’s portfolio in the local market and provided opportunities not only in collaboration with some famous local universities and recruiting students for studying in Scotland, but also providing approaches for research collaboration and tight links with Chinese education authorities. His other role is to improve HWU’s branding in East Asian countries and explore on potential joint-operations. Joint-operation between Chinese and British universities is nothing new. The University of Nottingham started the trend in 2006, opening its Chinese campus in Ningbo, second-biggest City in China’s vibrant Zhejiang Province. Xi’an Jiaotong-Liverpool University, jointly founded by Xi’an Jiaotong University of China and the University of Liverpool of the UK is another joint venture began operation in 2011. This March, China’s Ministry of Education approved HWU and Tianjin University of Science & Technology to joint run Bachelor of Engineering in Bio-engineering (Brewing and Distilling) program in China, allowing students to study in Tianjin instead of Edinburgh, but with an option of transferring from China to Scotland. Wang believes joint-operation is “the way forward” for any foreign university wanting to “strengthen” its Asian presence, and says an on-location department like that of he runs can act as a “bridge” to help the process running “much more” smoothly. But he has had a personal “bridge”, a huddle to cross in getting to where he is today. “The main reason I wanted to do a MBA in Edinburgh Business School was that I wanted to learn more international perspectives in business,” Wang says. “I wanted to be able to see how business people from different culture backgrounds can work together, and to gel with them. “To border my horizon was my priority during my MBA studies,” he continues, also acknowledging working with international colleagues in Scottish organizations paid dividends to his preparation and readiness in performing at his current job. As the UK government further tightening student visa for non-European applicants, Wang also urges global business schools to emphasis on the international experience they can offer to become more attractive to Chinese applicants. “At this moment in China, domestic business schools are doing really well in attracting Chinese students,” he says. “More and more students are looking into the option which is to stay in their jobs in China and do a part-time EMBA with a top Chinese business school. Reports from Sina.com show a significant increase in the establishment of new Chinese business schools who offer MBA degree: over the past three years, 113 new domestic business schools were born in China, doubling the total three-year ago. Coincidently, the number of Chinese MBA applicants has stayed at a steady 20 per cent increase rate for the same period, and is reported to hit one million applicants by the end of 2013. Wang says foreign business school are still in a “pole position” in reaching this ever-growing MBA applicants market, but they need to emphasis on the facts that “Chinese applicants’ class at your school will be filled with industry experts from all over the world”. “It will play a huge part in building an international business perspective for Chinese students, and the relationship circle they establish while in school can serve them in a life time,” Wang says. Do you need an MBA to break into McKinsey? Americans Who Want Finance Jobs In Booming China, Now's Your Chance!